Pre 2001 gossip and news. All culled from witnesses or the HK tabloids. Early pictures from Saturday night's party, thrown by Carina Lau Ka-Ling, to celebrate Tony Leung Chiu-Wai's win at Cannes: Leung and Lau (left); Rosamund Kwan Chi-Lam (centre). Others seen at the party were: Faye Wong, Nicolas Tse Ting-Feng, Stephen Chiau Sing-Chi, Christy Chung Lai-Tai, Gong Li, and Brigitte Lin Ching-Ha among others. One of Stephen Chiau Sing-Chi's rumoured girlfriends Yu Man-Fung has apparently been charged with a traffic offense and is scheduled to appear in court today. Chiau always wants to go to Hollywood. The 21st Century Fox bought the copyright of "God of Cookery" last year, Chiau will be the director and Jim Carrey will be the leading actor. But Jim Carrey wasn't free at that time, this project stopped. Yesterday the newspaper heard that "God of Cookery" Hollywood version will be shot next summer, the leading actor is still Jim Carrey, the director will be changed, and the superviser will be John Davis. Not only Jim Carrey is interested in this story, but the more important reason is he confides in John Davis. It was heard that Jim Carrey doesn't trust Chiau, so he asked to use an American director. After Jim Carrey finishing two films, "God of Cookery" Hollywood version will start to work. Chiau told to the reporter: "I only know Jim Carrey promised to be the leading actor, but I don't know other details of that film now." And director Lee, Lik-chi said: "We don't care if they ask us to direct this film, we still have work to do without Hollywood. When Chiau and I worked in "God of Cookery", we never thought about Hollywood would like this story. You should ask Chiau about the details of that film." 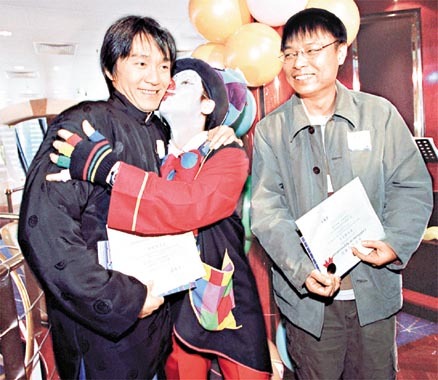 March 14, 2000 Oriental Daily reported Stephen Chow will appear in an Italian film festival. Besides, the festival also presents a few 1999 HK movies such as "Running Out of Time", "The Mission" and "Purple Storm". Stephen Chiau Sing-Chi (left) and director sidekick Lee Lik-Chi (centre) attended a children's charity event yesterday. Chiau, who did not shoot a Lunar New Year movie this year, completely dodged the question when asked which Lunar New Year movie he liked this year. Chiau: "Recently, the two movies that left the deepest impression in my mind were THE MISSION and BULLETS OVER SUMMER. I missed seeing these two movies and finally got around to seeing them during the holidays." He reiterated that he plans to use mostly new talent in his next movie SIU LAM JUK KAU SIU CHI (lit. SHAOLIN SOCCER KIDS). He hopes to begin shooting in May and have it ready for the summer movie season. LIFE is not always a laugh a minute as shown in Stephen Chow's movies and he knows that fact well. When the King of Comedy, 37, found out recently that an 11-year-old boy was stricken with leukaemia, but did not have enough money to seek treatment, he did not hesitate in parting with over HK$90,000 (S$20,000) to help. As early as last November, Hongkong's Apple Daily publicised Jiahui's plight as a leukaemia patient. The newspaper had even persuaded television celebrities such as Gallen Lo, Ada Choi and Maggie Siu to be tested for a bone marrow match, as well as encouraged the people of Hongkong to come forward. Recently, a match was found in America, but the cost of HK$190,000 was too prohibitive for the family. The newspaper managed to raise only HK$100,000 and so Chow stepped in to make up the remainder. He said of Jiahui: "From the last time I saw him, I don't know why I felt like the two of us are fated. That's why I hope to take him out for a meal and give him the cheque personally." Stephen writes "dragon" for the New Year! From the-sun in Hong Kong. Stephen in a police car during a charity road race event! (From Fluff in color) Click for the larger version. Director Lee Lik Chi writes a book about jokes. Stephen Chiau and Sandra Ng help him to promote it. 2. GORGEOUS 27,547,639 - Stephen had a cameo in this one! looks like whatever he's in is still gold in HK! There is a news in Taiwan's newspaper. It says: Chiau's new movie names "Soccer Boy in Shaolin"(I guess :p), a Japan actress and a China actress (maybe Zhou Wei) will work with him. Cecilia will participate in it too, and he will find a new actress in HK or Taiwan. His new movie will be shot in Apr. Stephen attended a charity function for Taiwanese earthquake victims. The reporter asked him about his interest in the internet and about what he was doing for new years. He replied that he would be in the audience for new years this year and that he was very interested in the internet, not only as it applied to entertainment. According to today's Orientaldaily, there are 4 Chiau's movies in the top 10 HK movies box office. No.5 All's Well, End's Well. No.8 Fight Back to School. No.10 All for the Winner. Chiau and Lee Likchi are planning to set up a website for artists, just like "Star East" or "HongKong.com". Nov 1999, - JACKIE CHAN TO TEAM WITH STEPHEN CHIAU. Superstar Jackie Chan plans to join forces with Canto comic Stephen Chiau Sing-chi for a future film. The pair last joined forces when each played a cameo role in the others 1999 Chinese New Year movie, with Chiau appearing in 'Gorgeous' and Chan in Chiau's 'King Of Comedy'. Speaking at the premiere of the film 'Purple Storm', Chan revealed that Media Asia, with whom he co-produced the movie, would make ten films in the coming year, of which he would be producing several. Lots of pictures and news on his plans for the upcoming year! August 1999 - assorted gossip. Again Karen has broken off with him. I have heard nothing else except he is very distraught. Rumor has it that Chang Cheh (genius kung fu movie director for Shaw Brothers in the 70's and 80's) will be helping him direct his new Action/Martial Arts Comedy. Gossip from the Internet April 6, 1999: here's a news update on Karen Mok vs. Stephen Chiau issue... karen apparently is now dating singer ritchie ren and has tried to break off her relationship with chiau after finding out he is dating someone else. Chiau however had refused to break up with Karen and Karen is now hiding in taiwan, doing promotions for her new album and avoiding Stephen Chiau. Feb 16th 1999 Gung Hei Fat Choi! The First Weekend of King of Comedy, Sing Jai has the #1 film! Feb.13th 1999 click here for King of Comedy real player trailer! January 28th 1999 -; the site for his upcoming Movie, The King of Comedy! Be aware its all in chinese! a big5 reader will help. November 16th 1998 -; My friend just got back from HK and told me Stephen was seen with Karen Mok in the front row of Sammi's concert. October 10th 1998 -; While in Hong Kong I saw Sing Jai on TV. It seems he was drafted to be in a Chinese Opera... I did not get the whole gist of the thing but he seemed to be a guest star along with Chow Yun Fat. I was so stunned to see this I couldn't follow the interview the held with him after the clip. Not that my chinese is all that great to follow him anyhow. Anyone else who saw this in HK and has info, I'd appreciate hearing about it! I have pictures and will post them shortly. August 17th 1998 -; Sing Jai was at Karen Mok's Concert in HK. His new movie may be called The Lucky Guy, but Stephen Chiau Sing-chi's fortunes have been mixed. After years of trying, the Hong Kong star has once again been refused residency abroad. The Canadian Federal Court in Vancouver rejected his request for a judicial review after the immigration department denied his application. Why? They don't like his friends. And they don't mean the usual movie-set groupies. Citing "secret evidence," officials say Chiau is involved in organized crime. His lawyer denies that. "It is not fair. The decision is based on secret evidence he can't challenge." But being stuck in Hong Kong is not all that grim for Chiau. The fans at home have ignored the twists in his immigration tale. The 34-year-old remains one of the most popular actors around. During the traditionally lucrative Chinese New Year season, his film out-gunned Hong Kong movie icon Chow Yun-fat's The Replacement Killers at the territory's box office. Lucky rang up over $3 million while Killers bagged $2.4 million. Summary : Comic film star Steven Chiau Sing-chi lost his battle to emigrate to Canada. crime and a member of the Sun Yee On triad. appealing against the Canadian Government's rejection of his application to immigrate. million damages over allegations he walked out on a movie. Summary : BEING a superstar does not necessarily translate into being a super-director. making of his latest movie, A Chinese Odyssey - Part One: Pandora's Box. 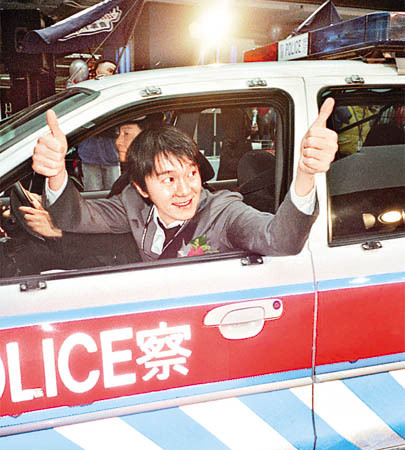 Summary : FILM star Chiau Sing-chi was yesterday acquitted of driving at 105 km/h. not only broke box office records but also provided Chiau with an ideal role. Stephen Chow Sing-Chi Lacks Confidence for Briefs... He's wrong...I'll just leave it at that.